William "Bill" Jefferson Clinton (born August 19, 1946) was the 42nd President of the United States from 1993 to 2001. He is married to the current Secretary of State, Hillary Clinton. Jan Kopold was not home when Bill Clinton visited Prague . Like many Czechs studying abroad after the invasion, he was afraid to return home until he had completed his studies. 'My friend Bill Clinton will come to Prague. If he cannot find an affordable hotel, he may stay with you,' Jan wrote his parents from Turkey, where he died a few months later in a fall from an abandoned house near Smyrna. 'He has a wide knowledge of political systems and will come from Moscow,' Jan wrote, in a letter his parents proudly read aloud. 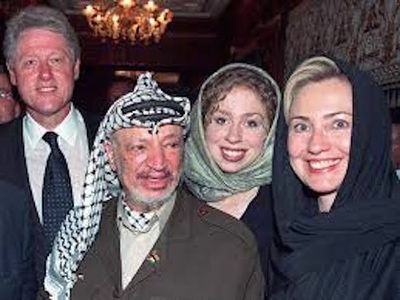 For six days Clinton stayed with the Kopolds, walking through the winding cobbled streeets of the old city, visiting museums and tourist attractions, and returning home every night for dinner with the family, they recalled. Jirina and her husband Bedrich called him a 'very nice and friendly young man,' intensely interested in the Prague Spring reforms and how to help Czechoslovakia throw off the oppressive boot of the occupying Soviet Army. The Kopolds' daughter Bedricha spent some time accompanying Clinton. And on his last day in Prague, Jirina's mother Marie Svermova took young Bill for a stroll. 'I went with Bill to the Strahov library and the Loretta (monastery),' Mrs. Svermova wrote in her diary. From 1945 to 1951 she was a member of the politburo of the Czechoslovak Communist Party. In the show trials of the 1950s, she was purged from the party and spent six years in Communist prisons. In fact, the Kopolds rank among the grand old families of Czechoslovak communism. Jirina's father was a former editor-in-chief of the Communist Party daily Rude Pravo, and a top member of the Moscow-based Czechoslovak Communist Party leadership during World War II. He died in the Tatra mountains, fighting alongside the Soviets to free Czechoslovakia from Nazi rule. But the family was Jewish and had spent time abroad. In 1951, when the Stalinist purges of the Czechoslovak party leadership began, Marie Svermova and Bedrich Kopold were expelled from the party and sent to prison. Marie Svermova served six years in a Communist jail, and became one of Dubcek's most prominent supporters in the Prague Spring. Later, she was one of the first to sign the Charter 77 human rights document, along with such dissidents as Vaclav Havel, who in 1989 led the 'velvet revolution' that overthrew Czechoslovakia's communist rulers. Even in 1970, Clinton seemed to be considering a career in politics: 'We often discussed how to help Czechoslovakia out of its terrible situation,' Bedrich Kopold recalled. 'One day we walked past the American Embassy and I said to Bill, 'Some day you will come back as ambassador or cultural attache,' and I laughed. Bill looked at me very seriously and said he well might,' Kopold continued. 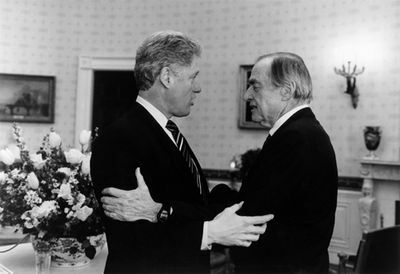 Sitting in their living room, with the works of Marx and Lenin on the bookshelf in front of them, the Kopolds say they never recognized Clinton on television. They said unless they had been asked about their nearly forgotten American guest, they never would have known he had stayed in their home. Years later, when Clinton was President, he again flew to Moscow, this time on Air Force One, to meet Boris Yeltsin. Then, on his return flight he had the plane stop in Prague. A night of fun - and a surprise arranged by Vaclav Havel - were on tap for Bill Clinton when he visited the Golden Tiger, a Prague pub. The Czech President had arranged a reunion between the US President and the parents of a now-deceased Oxford classmate. The frail, white-haired woman across the table from Mr Clinton at the pub on Tuesday night was Jirina Kopold, who met her son Jan Kopold's American friend when he visited Prague after a visit to the Soviet Union in 1970. After graduating from Yale Law School in 1973, Clinton became a professor at the University of Arkansas. In 1974 he ran for the House of Representatives for Arakansas, but was defeated by the incumbent, John Paul Hammerschmidt. In 1976, he was elected Arkansas Attorney General. In 1978 Clinton ran for governor of Arkansas, defeating Lynn Lowe and becoming the youngest governor in the country at age thirty-two. He served as governor until 1992. From 1974 onward, Rapoport donated to every one of Bill Clinton's campaigns and served as fundraiser for both presidential bids. On March 18 1994 President Clinton appointed Susan Hammer, Fu Tong-Hsu, Bernard Rapoport, Jack Sheinkman and Paula Stern to the Advisory Committee for Trade Policy and Negotiations. Bill Clinton to this day will recall that Sheinbaum was among the first who leant support to his fledgling run for the presidency. 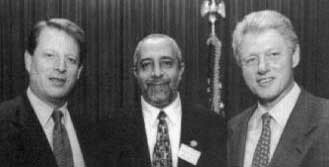 On March 23 1994 President Clinton appointed Stanley Sheinbaum, Roger Hilsman and Robert Shamansky to the National Security Education Board. Clinton won the 1992 presidential election (43.0% of the vote) against Republican incumbent George H. W. Bush (37.4% of the vote) and billionaire populist Ross Perot, who ran as an independent (18.9% of the vote) on a platform focusing on domestic issues. He was inaugurated as the 42nd President of the United States on January 20, 1993. In April 1993, President Clinton nominated legal scholar and civil rights attorney Lani Guinier to the position of Assistant Attorney General for the Civil Rights Division of the United States Department of Justice. 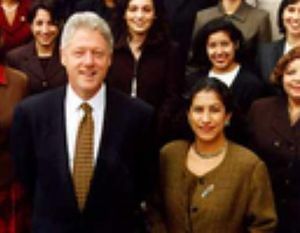 Professor Guinier was also a personal and long-time friend of the Clinton’s. Their friendship dated back to law school at Yale University. The Clintons even attended Guinier’s wedding in the 1980s. By June 1993, President Clinton withdrew Guinier’s nomination after a Republican-led attack successfully shattered her credibility enough to quash her appointment to the critical justice and civil rights post. In 1995, 22-year-old Monica Lewinsky was hired to work as an intern at the White House during Clinton's first term, and began a personal relationship with him, the details of which she later confided to her friend and Defense department co-worker Linda Tripp, who secretly recorded their telephone conversations. "Now, I have to go back to work on my State of the Union speech. And I worked on it until pretty late last night. But I want to say one thing to the American people. I want you to listen to me. I'm going to say this again: I did not have sexual relations with that woman, Miss Lewinsky. I never told anybody to lie, not a single time; never. These allegations are false. And I need to go back to work for the American people. Thank you." However on August 17, 1998, Clinton admitted in a taped grand jury testimony that he had had an "improper physical relationship" with Lewinsky. That evening he gave a nationally televised statement admitting his relationship with Lewinsky which was "not appropriate". Bill Clinton was impeached by the House of Representatives on December 19, 1998, and acquitted by the Senate on February 12, 1999. The two charges passed in the House (largely on the basis of Republican support but with a handful of Democratic votes as well) were for perjury and obstruction of justice. The perjury charge arose from Clinton's testimony about his relationship to Monica Lewinsky during a sexual harassment lawsuit (later dismissed, appealed and settled for $850,000) by Lewinsky's former colleague, Linda Tripp. The Senate concluded a twenty-one day trial on February 12, 1999, with the vote on both counts falling short of the Constitutional two-thirds majority requirement to convict and remove an office holder. The final vote was generally along party lines, with no Democrats voting guilty. Some Republicans voted not guilty for both charges. On the perjury charge, fifty-five senators voted to acquit, including ten Republicans, and forty-five voted to convict; on the obstruction charge the Senate voted 50-50. The New Democrat Coalition was founded in 1997 by Representatives Cal Dooley (California), James P. Moran (Virginia) and Timothy Roemer (Indiana) as a congressional affiliate of the avowedly centrist Democratic Leadership Council, whose members, including former President Bill Clinton, call themselves "New Democrats." In November 2012, the New Democrat Coalition announced the election of its new leadership team. New Dems elected Rep. Ron Kind (WI-03) as the Chair and re-elected Reps. Jim Himes (CT-04), Rick Larsen (WA-02), and Allyson Schwartz (PA-13) as Vice Chairs and added Rep. Gerry Connolly (VA-11) as a Vice Chair. Emira Woods, Matthew Yglesias, Fellow, Center for American Progress, Reuben Brigety, Director, Sustainable Security Program, Center for American Progress, Jamie Fly, Executive Director, The Foreign Policy Initiative and Heather Hurlburt, Executive Director, National Security Network were speakers on the Threat Assessment: How the U.S. and the global community should deal with terrorism, rogue states, and nuclear proliferation panel at the Campus Progress Conference held at the Omni Shoreham Hotel in Washington, D.C., July 8, 2009. Other speakers at the conference included President Bill Clinton, Speaker of the House Nancy Pelosi, Secretary of Health and Human Services Kathleen Sebelius and Van Jones, former Special Advisor for Green Jobs, White House Council on Environmental Quality. President Clinton delivered remarks at a dinner for the conference on Progressive Governance for the 21st Century, in Florence Italy, November 1999. 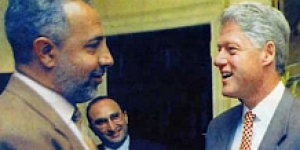 The summit began on former U.S. President Bill Clinton's initiative in 1999. Italian Prime Minister Romano Prodi, British Foreign Secretary David Miliband, British Prime Minister Gordon Brown and former U.S. President Bill Clinton sit down for the first working session of the Progressive Governance Summit on April 5, 2008 in Hertfordshire, England. The summit will this year address globalisation, climate change and poverty with over 300 delegates attending. The Global Progressive Forum brings together politicians, trade unions, NGOs and progressive representatives of international organizations. Participants confirmed to date include President Bill Clinton, Pascal Lamy, Howard Dean, Barney Frank, Helen Clark, [Antonio Guterres], Vandana Shiva, Salima Ghezali, Susan George, Zwelinzima Vavi, Aminata Traore, Chico Whitaker and many more. The challenges are finding new answers to the global crisis – including economic and financial crisis, food crisis and climate and energy crisis – and stepping up efforts to work together to reshape globalization. In the wake of the economic crisis, the PES joined Europeans for Financial Reform (EFFR), a coalition of NGOs, foundations and civil society actors that demand a stronger regulation of financial markets. In order to push for such a regulation world-wide, EFFR cooperates with its US partner Americans for Financial Reform. The PES also maintains regular contact with US Democrats and over the years we have worked together in the fields of Nuclear nonproliferation, climate change and globalization. Former US President Bill Clinton was one of the key speakers in the 3rd World Conference of the Global Progressive Forum (GPF, a common initiative by the PES, the Socialists & Democrats group in the European Parliament and the Foundation for European Progressive Studies to address the negative aspects of globalization). 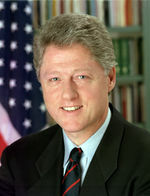 Upon completing his second term as President of the USA, Clinton dedicated himself to philanthropy and continued public service, particularly through the William J. Clinton Foundation. Clinton is the founder of the William J. Clinton Foundation which promotes and provides for a number of humanitarian causes. The foundation has focused on supporting AIDS awareness campaigns and making treatment for HIV/AIDS more affordable. Receiving funding from a number of foreign governments, the foundation also seeks to address such problems as global public health, climate change, poverty alleviations and religious and ethnic conflict. 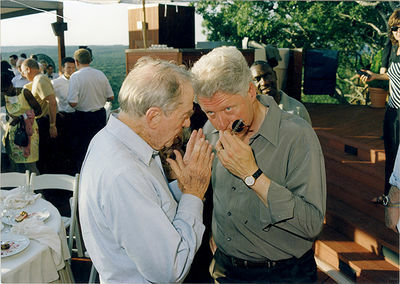 In addition to his Foundation work, President Clinton joined with former President Bush to help with relief and recovery following the tsunami in the Indian Ocean, and to lead a nationwide fundraising effort in the wake of Hurricane Katrina. He also served as U.N. Special Envoy for Tsunami Recovery from 2005 to 2007. In November 20113, Bill Clinton was awarded the Presidential Medal of Freedom by President Barack Obama. This page was last modified on 13 December 2018, at 16:53.